This week I’m wrapping up my spring season of shows with a fun one-two-three punch. On Thursday, I head back to UC-Davis, where the good people of Sacramento Area Youth Speaks continue building one of the most innovative, impressive spoken word and youth empowerment programs in the country. The collaboration between the university and the local school districts, not just talking about how spoken word and critical literacy can be a progressive educational model but actually building classes and programs to make it happen — it reminds me a lot of the early days of First Wave back at UW-Madison. This Thursday is SAYS huge annual conference, and I’ll be leading workshops for some of the 500-plus young lyricists and leaders. Sacramento Area Youth Speaks (SAYS) Annual Summit and Slam. with Dahlak Brathwaite, Jeff Duncan-Andrade, Eli Jacobs-Fantauzzi, and more. The next day, it’s down the California coast to sunny San Luis Obispo, where I’ll be performing alongside some of the top poets from the West Coast — and apparently we’re competing against each other. I guess I should have realized that when the organizers told me it was called the Anthem Poetry Slam, but hey, good listening is overrated. I haven’t slammed in years, so I’m going to come extra hard — and by extra hard, I mean I’m going to punch out all the poets, all the judges, and probably the timekeeper too. Is that a metaphor? Come to the show and find out. Cal State Poly, it’s on. with Buddy Wakefield, Rudy Francisco, Tatyana Brown, and more. And then the show I’m most excited about and the farthest distance on my epic California road trip, on Sunday night I have to drive all the way from Oakland to….San Francisco. I’m telling you, that Bay Bridge is pretty damn long. But hey, for all my Bay Area fam folks, this should be a fun one. 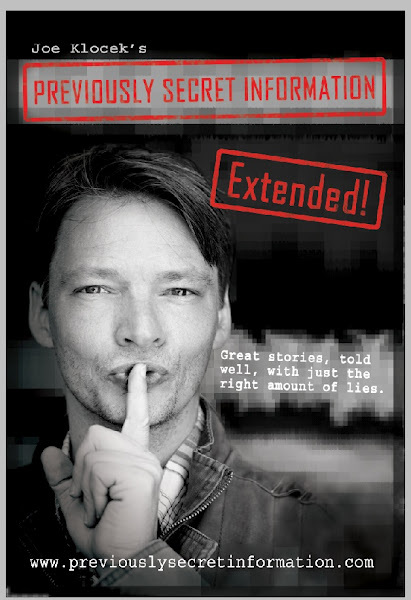 It’s a live storytelling show called “Previously Secret Information,” produced by and featuring local comedy legend Joe Klocek. If you don’t know Joe, check this clip of him below that just went viral. Dealing with a drunk heckler, sometimes you gotta be harsh. And hilarious. I don’t expect any such outbursts at our show, but I will be premiering a new piece called “Pants Down in Wisconsin” — so maybe there will be some a protest from outraged Green Bay Packers fans or pants-rights activists. Again, there’s only one way to find out. Come on down. Turn off that Netflix, and come support live performance! Trust me, it will be better than season two of Weeds. Stage Werx Theatre. 446 Valencia St, San Francisco.